Learn five secrets of the California Crackup. 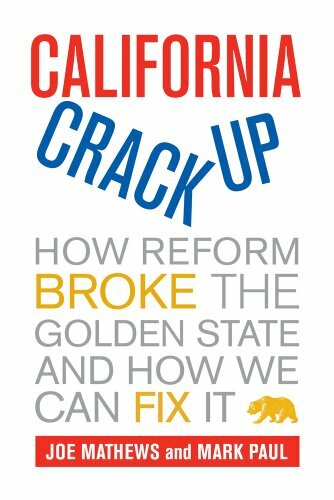 California's government has never quite worked. California’s constitution had no framers and the state had no Founding Fathers. For its entire history, it has relied upon a series of improvisations and silver bullets of reform, each one piling new unintended consequences on the last. Prop 13, the 1978 Jarvis-Gann initiative, did much more than reduce property taxes. It created a new operating system for the state. It moved power away from school boards and city hall, centralizing decision-making in Sacramento, a long-held goal of liberals, and helping public employee unions to increase their power in local government. California has the world’s most powerful – and inflexible – system of direct democracy. It's the only place on the planet where a law passed via ballot initiative cannot be amended or changed by the legislative body without another vote of the people. The power to circumvent legislative and executive accountability completely is one reason why California’s system is dysfunctional – and why budgets never seem to balance. For its entire history, California has been a state of arrival, with a majority of its electorate and workforce born and raised somewhere else. But it will soon have what it's never had before: California’s first homegrown majority. A state that has relied on new arrivals to bail it out will have to rise or fall with the citizens it produces itself. California doesn't have one governing system, it has three systems. These three systems are at war with each other: an election system designed to produce governing majorities, a consensus-based legislative system that amounts to minority rule, and an inflexible system of direct democracy that trumps the first two systems. California doesn't work because it can't work.